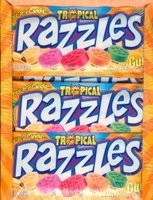 Razzles Gum is available in fruit, sour and tropical flavors. First it's candy then it's gum a favorite retro candy. First there was original flavor razzles, then sour razzles and last but not forgotten is tropical flavored razzles. You can't go wrong with which ever flavor of this old time bubble gum you choose. Besides razzles we have all your old time favorite bubble gum; rain blo, big bol, bazooka, hot dog bubble gum, chiclets and freshen up. 24 packs of razzles old time chewing gum per box.